When a player gets his first opportunity of first team football it is a big occasion and one that surely he hopes will go really well. When a player is just 17 years of age then he must hope to make something of an impact to set up his career with a good start. Back in January 1957, Burnley were looking for a new centre-forward. 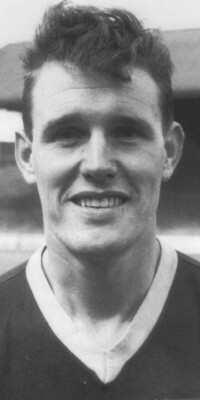 The diminutive Peter McKay was set to return to Scotland and manager Alan Brown had used Les Shannon in the role for four games in which the wing-half had scored twice. However, successive defeats as 1956 came to an end saw Brown opt for youngster Ian Lawson when we played Chesterfield at home in the third round of the FA Cup. To say Lawson made an impact is something of an understatement. He scored after just four minutes to give Burnley the lead. It was 2-0 at half time but Lawson soon added the third and nine minutes from time completed his hat trick for our fifth goal. He added a fourth for himself with the final score Burnley 7 Chesterfield 0. He kept his place for the league, but he'd certainly taken a liking to the FA Cup. The next round saw non-league New Brighton at Turf Moor and Burnley recorded a 9-0 win. No four goals this time for Lawson, just three to take his total to seven in two ties. Incredibly he wasn't even a reserve team regular, but here he was being allowed to lead the team off twice in these cup matches. He was the talk of the town and everyone was tipping him for stardom. He played another two FA Cup ties that season, also played in seven league games, and is total of goals was ten in eleven games. Such was his impact that he was called up for England at youth level in the September and played alongside club team mate John Angus against Spain at Birmingham's St. Andrew's. Things didn't quite work out though and in the next two seasons (1957/58 and 1958/59) he didn't play a single game in the first team and had to settle for reserve team football. The 1959/60 season saw him play nine times, eight of them in the league. By now he was at inside-right and came in as understudy for Jimmy McIlroy. Despite his lack of first team football he still made his mark. He scored three goals including the winner against Manchester United at Old Trafford. Such was football fifty years ago that he was serving his National Service at the time and Burnley had to get permission to play him in some of those games. The 1960/61 season saw him play another ten games, but still he couldn't establish himself in the first team and when there wasn't a single appearance again during the 1961/62 season he was sold to Leeds in March 1962 for £20,000. Leeds had a player/manager at the time by the name of Don Revie and on the day Lawson made his debut for his new club it proved to be Revie's last game as a player. He played a major part in Leeds' promotion back to the First Division in 1963/64 but lost his place early in the following season and didn't feature in the FA Cup run that saw them reach the final at Wembley. His days at Elland Road were over and he moved on to Crystal Palace at the end of that season, the Second Division club paying £9,000 for his services. He was there for just a season and that was followed by a season at Port Vale. The summer of 1967 saw him move yet again, this time to Barnsley, but he never made the first team there and at the age of 28 his football career was over. A career of real promise as a youngster had been propelled onto the big stage with those goals as a 17-year-old. Some say it came to early for him, but whatever the reason it just didn't really happen for Ian Lawson and those first few games proved, probably, to the just about the peak of his career. For all his clubs he played just 92 league games and scored 30 goals, but of course there is the FA Cup to add to that, and Burnley fans of the time will never forget the impact he had on that particular competition in 1957.